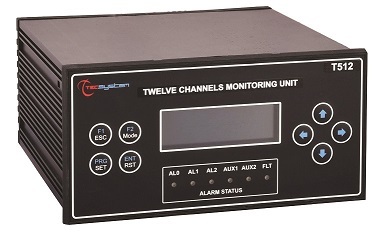 The intelligent multi-channel T512 temperature controller is mainly oriented towards controlling motor temperature, but it can be used wherever you need to monitor a maximum of 12 independent channels. The T512 is equipped with 12 Pt100 RTD inputs and 5 output relays. All input channels are protected from electromagnetic interference for consistent, reliable performance. A unique 20-character LCD simplifies programming parameters and alarm management and allows the operator to immediately view operating data. An optional Modbus RTU RS485 output is available for applications requiring a digital output. The T512-Basic includes the output relays listed above. The T512-RS485 adds the Modbus RTU RS485 output to the relays listed above.